I am a military spouse and we are about to be stationed in Puerto Rico. I’ve been “learning Spanish” for over a year now, and I just haven’t made much progress. I use every stall tactic in the book and I’m just not where I think I should be. This is funny for a number of reasons, and I’ll just share a few of them here. –I have a Master’s degree in teaching foreign languages. I teach and tutor for a living. You would think that I’d be an amazing student. –I was an amazing student. You know the sort – top of the class, overachiever, went above and beyond because it made me happy. Yeah. –I already speak French and German. You would think that a third language would be no big deal, right? –I have lived in France and Germany, so I really know how important it will be to speak Spanish in Puerto Rico. I know that no matter how well everyone speaks English, we’ll miss out on a layer of life as monolingual. 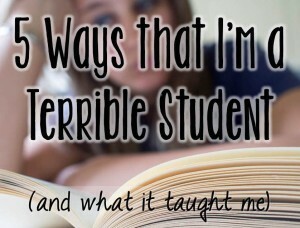 Well, it turns out that all of these things (and some other issues) make me a terrible student. I look at my own experiences learning Spanish and it tells me so much about being a language teacher. 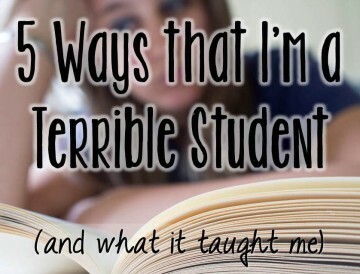 Here are 5 Ways that I’m a Terrible Student. I love talking. All I want to do is talk. When I moved to France, I made a lot of French friends and spoke a ton of informal French. I want to be able to have that same experience in Puerto Rico, so I’ve made speaking a priority. I worked with a Spanish tutor for a while, but she got mad at me for wanting to talk all the time. She wanted me to do more grammar and read literature, but I wasn’t interested in those things. So, what do you do as a teacher with a student who talks all the time? Make it part of the lesson, of course! Start off your lesson with 5-10 minutes of informal conversation. Later on in the lesson, make the students speak, using new vocabulary. I can fake it well. Because I know French, I can guess at a lot of Spanish vocabulary. In fact, this is often really impressive to people I’ve just met and they think that my Spanish is a lot better than it is. I can read Spanish at a very high level, so even I feel better than I am. It gives me a terrible attitude of superiority when it’s time to learn basic concepts (numbers, colors, etc.). What do you do with a student who listens & reads well? You make them write. Reading and listening are passive activities, so you need to get your student to take a more active role. Written work will also show you exactly what *gaps* exist in the student’s knowledge – imagine my tutor’s horror when she found out that I could analyze literature but not name the months of the year. I want to jump ahead. You’ve met this student before. This is your student in ESL who wants to talk about all of the English TV shows s/he likes, but still needs to master counting. Because I’ve had experience in other languages, I know that concepts exist (like the subjunctive) and I want to use them now. But “now” isn’t time yet, is it? I have to go step-by-step in Spanish, even if it’s frustrating not to be able to use everything that I know exists. What do you do with a student who questions everything? Well, have him/her make a list of questions in his/her journal. S/he can check back when you’ve learned a new concept. You can also have students write you questions as an Exit Slip. This is a great tool in the Foreign Language classroom because students are writing, thinking, and checking in with you on problems that they’re having. I get bored. Hey, teacher, I see that you’ve put work into creating this text that only uses present tense, but I am so bored reading about Jorge and Maria going to the mall. I am definitely the student who takes offense at being given this “leveled” text. I would rather read something real and not understand it than read what you’ve chosen for me. How do you challenge a student who’s bored? This is by far the easiest answer, in my experience. I never teach with artificially leveled texts in lessons – I always teach with authentic materials. I wrote about Newsy recently and how this site provides authentic, condensed news. This sort of news also exists in other languages, and students will respond better to real material. If you must teach a leveled text (from a textbook, etc. ), you can pair it with a song or a poem to show the same vocabulary in the real world. I’ll wait ‘til I get there. I know that I’ll learn Spanish faster once I’m immersed, so why bother struggling with it today? This is the one that I haven’t overcome yet, actually, so I’d love to hear your thoughts. What do you do with the student (like me) who’s just marking time until s/he gets on the plane? Leave your ideas in comments – I’d love to hear from you!